Earlier today a man describing himself as an “ordinary white man” opened fire on two New Zealand mosques. As I write this, forty-nine people are dead. The gunman has been identified as Australian citizen Brenton Tarrant. Not only did Tarrant livestream his attack, he also published a 73 page manifesto before his arrest. In the first page of Tarrant’s manifesto, he states he made money in BitConnect. As above, here’s is the relevant part of Tarrant’s manifesto that pertains to BitConnect. I did not attend University as I had no great interest in anything offered in the Universities to stufy. I believe “kebab removalist” is a reference to Tarrant’s terrorist attack. How much Tarrant invested and made in the BitConnect Ponzi scheme is unclear. In his own words though, he used BitConnect money to travel. He states no other source of income prior to his planned attack. Did Tarrant use BitConnect funds used to purchase firearms and ammunition? 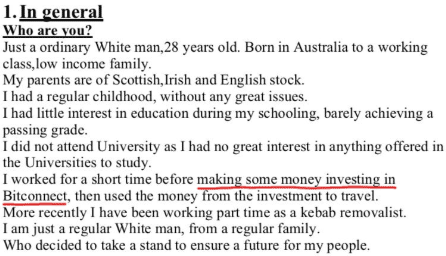 If you invested in BitConnect and are appalled by the Christchurch attack, I want you to grapple with the fact that some of the money you invested may have funded it. These multi-billion dollar MLM Ponzi schemes we’ve seen pop up… it’s not all “Hi, I’m Craig Grant and this is my YouTube account” fun and games. Funds laundered through BitConnect at least, appear to have financed Tarrant’s murder of 49 people. And who knows what else.